Lourdas Kefalonia: Lourdas is a quaint coastal settlement located 17km southeast of Argostoli, the capital of Kefalonia. The settlement stands on the hillside overlooking the blue sea. It is quite popular for its well-organized beach where many visitors enjoy a refreshing swim, right after their arrival to the village. The beach is surrounded by a green landscape with thick vegetation and beautiful waterfalls running through the mountains. The combination of the crystalline waters and stunning mountain backdrop of Mount Aenos provides a dream scenery that captivates all visitors. The beach is covered with white sand and two rows of sunbeds and colorful umbrellas. Right above is the main road of Skala filled with plenty of restaurants, cafes, local shops and other modern amenities. 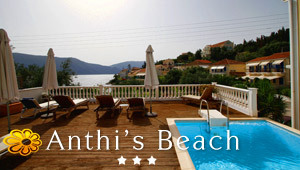 It is easily accessed with public buses from Argostoli and other villages. Not far from the coast lies the Monastery of Sissia. One of best beaches in Kefalonia.